Calculations at a small stellated dodecahedron. 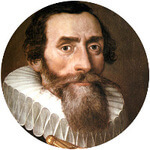 This is the first of four Kepler-Poinsot polyhedra or regular star polyhedra, which are regular, non-convex (concave) polyhedra. The small stellated dodecahedron is made from a dodecahedron with edge length a, whose edges are extended so that five meet in one point. 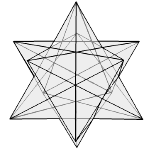 As a result, a fitting right pyramid with a regular pentagon as base is attached to each of its faces. 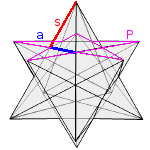 The sides of the pyramid are isosceles triangles, the ratio of ridge s to edge a is that of the golden ratio, like in the pentagram b to c. s, c and A are the same as at the great stellated dodecahedron. Enter one value and choose the number of decimal places. Then click Calculate. Edge a, ridge s and face P.